Get a taste of helicopter flying with this quick budget tour. For a quick taste of the local area head off on a chopper ride from Coolangatta travelling at just 500m along white sandy beaches to Point Danger. It’s amazing how much sightseeing you can cram into ten minutes from a helicopter! Climb on board one of our fleet of helicopters as we take you out from the Gold Coast Airport at Coolangatta for a scenic helicopter flight and track forward towards the rugged coastal scenery of Point Danger before rushing along the stunning beaches northwards at an altitude of 500 feet. Take the chance to watch the local surfers catching their waves at the popular Snapper Rocks, Kirra Beach and then up to Palm beach before we ascend to 1000 feet, bank the helicopter left and head back to the airport with amazing views of Coolangatta and the southern coastline down to Byron Bay. Start at Gold Coast Airport and head south to Point Danger! Rush along beaches north at 500 feet and watch local surfers at Snapper Rocks, Kirra Beach and up to Palm Beach . Climb up to 1000ft and see stunning view of Coolangatta and the southern coastline down to Byron Bay. 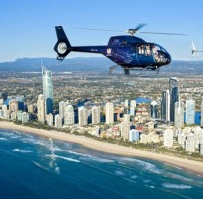 Book a 5 Minute Gold Coast Heli Flight online.